Easter | Anything is Possible! As Easter approaches I have extra choir duty, I’m getting rid of a nasty cold, and preparing to drive to the mountains on Monday. 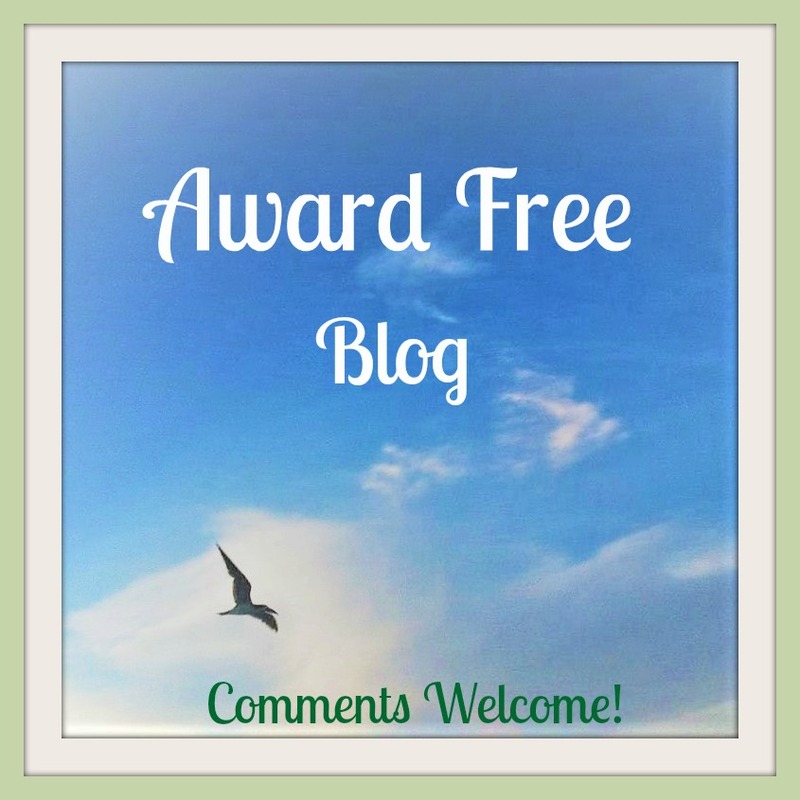 So, to make things a little easier on myself, I’m doing a bit of re-cycling here on WordPress. In 2015, I did a series of posts about Jesus Christ Superstar and how the movie and music impacted my life. In this song, Jesus, played by Ted Neeley, faces his fear in the garden of Gethsemane. Sure puts my little challenges in a different perspective. Categories: Jesus | Tags: Easter, Jesus, Jesus Christ Superstar | Permalink. Well this is a real fine mess. I can’t connect to my blogs on my laptop. I wonder how many people blog from a phone. This won’t be my first time, but I hope it’s not a regular thing. The first thing that popped into my head when I read Linda Hill’s SOC prompt, “real,” was the story of the Velveteen Rabbit. I think it was the toy (stuffed) bunny, or was it the old rocking horse talking to the bunny, who said real happens to you over a long time, after your fur has been rubbed off, or loved off. It’s like a Pinocchio story about a toy bunny. A rather sad story in some ways, but the message I like is that real isn’t about being new and shiny. Real is about depth and character. When I was a child, I knew, intellectually, that my stuffed animals were not real. Yet another part of me felt that they had feelings. I was upset when the disappeared during one of our cross country moves. The moving gremlin must’ve gotten them. I don’t want to think about that anymore. What if loving an inanimate object puts some kind of energy into it? I’ve heard you can do Reiki on a car and help it run better. I have not experienced that. But I do believe that our thoughts have real effects sometimes. Of course there’s God, and angels and possibly other forces and powers that could be influencing a car to start. So where to go with this? If real means old and shabby and loved instead of new and slick and shiny, then I’m feeling real. Yes, my body is very real. My legs in particular are real as I notice more of those spider veins. I’ve heard I can get those zapped with a laser and they will disappear. But why couldn’t we just see spider veins as a form of abstract art? I’ll have to think about that. A more real issue is shaving my legs. Since my hair is light in color and getting thinner, I’ve gotten away with not shaving my legs for months. That’s about to change as I’m about to give in to cultural influence. But I think I’ll keep my abstract, natural spider tattoos for a while. I wonder, from a global perspective, how many women worry about such things. I guess spider veins and shaving legs are relatively minute, practically microscopic, in the grand scheme of things. A real bunny rabbit, is another matter. Don’t buy a real bunny for Easter. It’s just not fair to the bunny. But you could buy a toy bunny and love it into real. Categories: Animals, Art, SOC | Tags: #SoCS, bunny rabbits, Easter, Reiki, SOC, spider veins, The Velveteen Rabbit | Permalink. 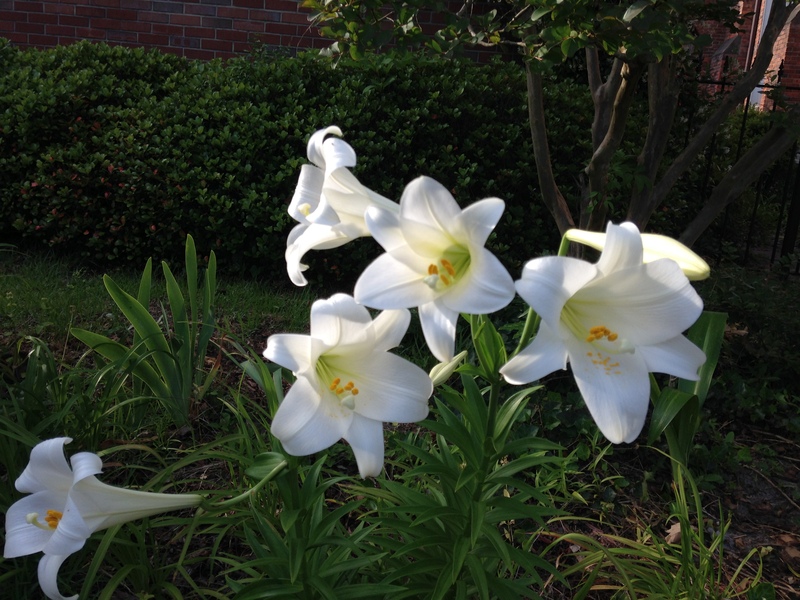 My friend, Alice, plants all the leftover Easter lilies around the church each year. They come back the next year in time for Pentecost, the church season after Easter. The Pentecost lilies started blooming sometime last week. I took these photos Wednesday evening. 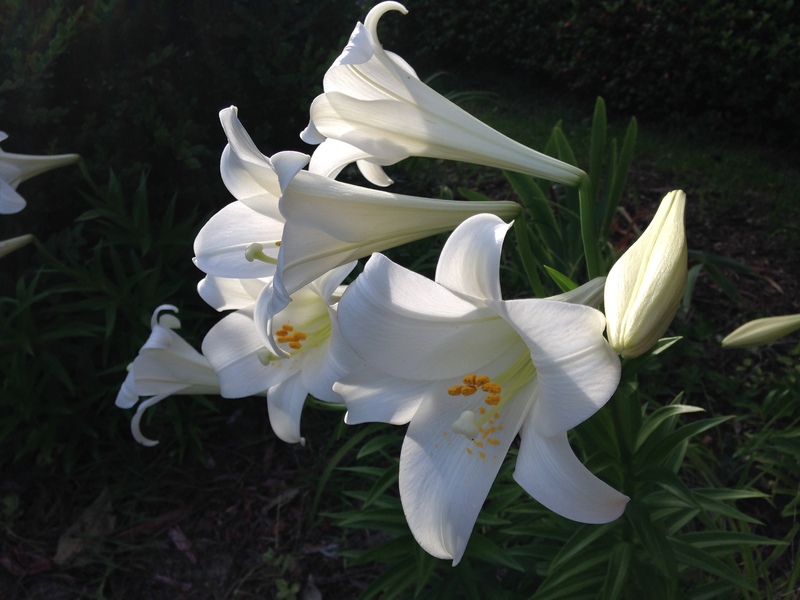 Categories: Earth and Nature | Tags: Easter, lilies, Penetcost | Permalink.